102 class-leading products win What Hi-Fi? Awards 2018 | What Hi-Fi? The wait is over. This morning we have revealed the very best 102 products in the hi-fi and home cinema markets, from the smallest in-ear headphones to the biggest 4K TVs, from high-end hi-fi components to the latest home cinema kit. So who has won big this year? Sony retains its usual favourable form with eight Best Buys for two pairs of wireless headphones, the PS-HX500 USB turntable, a big and a small TV, its HT-ST5000 Dolby Atmos soundbar, and a budget Blu-ray player and home cinema amplifier. Audio Pro makes a big impression in both the wireless speaker and multi-room system categories with four Awards in total, while Beyerdynamic dominates the headphones categories, Rega once more wins repeatedly for turntables between £249 and £1469, and Chord Electronics masters the DAC class. The stereo speakers category has seen the biggest number of changes, with the KEF R3s, Spendor A7s, Dali Oberon 5s, Mission QX-2s, ProAc Response DT8s and two pairs of Fyne Audio floorstanding speakers decorated with What Hi-Fi? Awards for the first time. Repeat winners include Ruark Audio’s MR1 Mk2s, the Dali Spektor 2s, Monitor Audio Bronze 2s, KEF’s Q350s, Dynaudio’s Special Fortys and Revel’s Concerta2 M16s. There’s plenty more to celebrate too, and you can see the entire list of 102 Best Buy 2018 winners here. 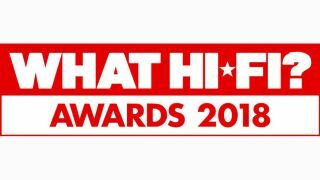 Of course, one Best Buy in each of the 25 product categories will be awarded an even more prestigious Product of the Year trophy on at the annual What Hi-Fi? Awards ceremony on the evening of Wednesday 7th November. So there’s another date for your diary. Those winners will be published online, and the special What Hi-Fi? Awards issue of the magazine will go on sale the next day, Thursday 8th November. Like last year, there will also be five special Product of the Year Awards to give out on the night: Innovation, Temptation, Readers’ Awards and Hall of Fame, as well as an Outstanding Contribution to recognise an industry member's career.